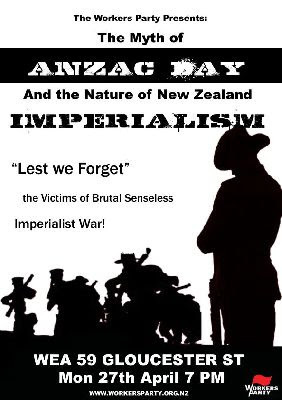 The far left hates the fact that every ANZAC Day, hundreds of thousands of Kiwis, young and old turn out to Dawn Parades, to pay their respects to our armed services. They especially hate the fact that the parades are getting bigger every year. The Workers Party is doing its best to counter this "unhealthy" trend. That's socialist "patriotism" for you. Like North Korea's attack on South Korea, and its backing by China. Like the USSR's attack on Afghanistan. Like the USSR in Budapest in 1956, Prague in 1968 etc etc. Repulsive little bastards aren't they? Philosophical allies of Hitler. Philosophical allies of Hitler - cool straw man bro.